SKB Deluxe ATA is one of the best golf bags for travelling currently available on the market, and one reason for this is because it is constructed to meet the highest ATA shipping container specifications. It has a TSA Lock System that helps keep your golf bag safe and also makes inspection easier at the airport. A perfect match valance bending system provides protection against moisture, dirt and dust and the case it also contoured to fit most types of carry and cart bags. SKB Deluxe Standard ATA is one of the best golf bags for travelling currently available on the market, and one reason for this is because it is constructed to meet the highest ATA shipping container specifications. It has a TSA Lock System that helps keep your golf bag safe and also makes inspection easier at the airport. A perfect match valance bending system provides protection against moisture, dirt and dust and the case it also contoured to fit most types of carry and cart bags. It is a very lightweight case to ensure that it does not add significant weight to your luggage and to top up everything it comes with an unconditional lifetime warranty. Contoured: The contoured design is one of the things that set this bag apart from others on the market, and it makes it possible for it to fit most carry and cart bags and also dividers of up to 48 inches long. Weather Proof: Its construction prevents dirt, moisture and dust and hence making sure that you always find your gear in the same condition no matter how long they are in the case. TSA Locking System: TSA Locking System not only ensures maximum security but also makes airline travel easy for golfers. Lifetime Warranty: The manufacturer has a lot of faith in the quality of the product and so it comes with an unconditional lifetime warranty. 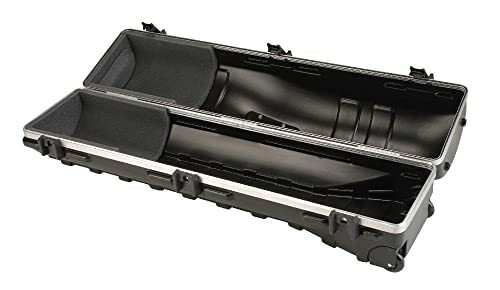 Weight and Dimensions: SKB Deluxe Standard ATA Golf Travel Case weighs 18 pounds when empty and has an interior dimension of 48 x 12 x 11 inches and an exterior dimension of 52 x 14 x 14 inches. The case also includes the $ 1,500 club coverage from SKB. A golf bag is one of the best things a golfer could ever wish for but it has its limitations, and most of them are evident when moving your gear for long distances. 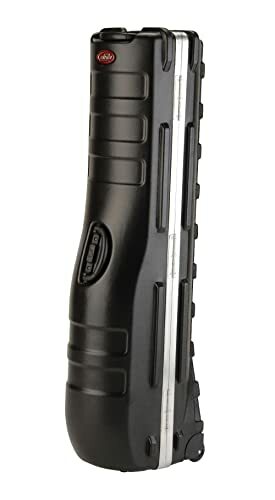 However, you can solve almost all of these challenges with a quality case like the SKB Deluxe Standard ATA. This case is designed to protect your gear against all the common things that they face such as dust, moisture and damages from falls or bumping into other things when on transit. It is unyielding meaning that it can withstand almost anything, and it has TSA locks to keep everything safe. Although it also has a few shortcomings the benefits that you get from it are greater than the few cons. And to sum it all, it is affordable and hence making it perfect for a golfer.